Bike Ambulances Improve Lives in Uganda : Shots - Health News A Ugandan who has studied engineering in the U.S. is working to solve medical transportation problems in his homeland. A nonprofit he founded is helping villagers build bicycle ambulances from scrap metal. When Chris Ategeka was 9, his younger brother died while Ategeka was helping to carry him to the nearest hospital — 10 miles from their village in Fort Portal, Uganda. There was no quicker way to get his sick brother, who was coughing and had a bloody stool, to medical care. "I did not understand the concept of lack of mobility being the biggest factor until it got later in life. I realized how that could have helped so much," he tells Shots. 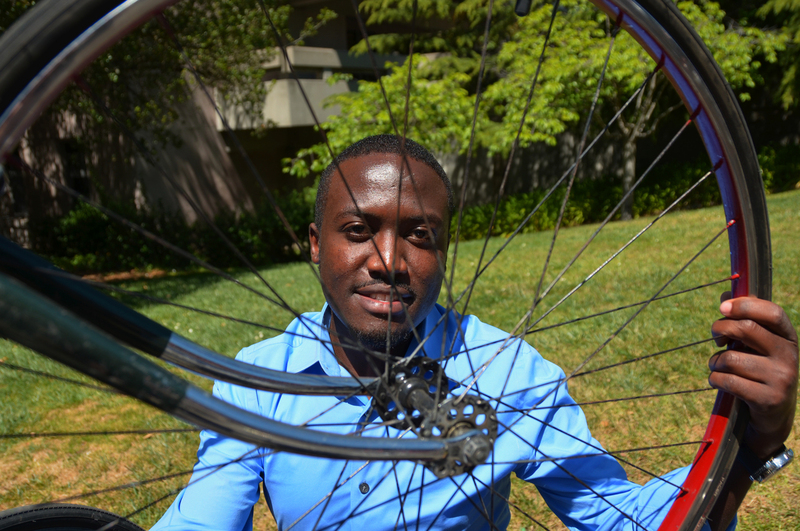 Chris Ategeka started a nonprofit to help villagers in rural Uganda build their own bikes. Ategeka and his five siblings became orphans after their mother and father died of AIDS. But Ategeka, now 28, considers himself lucky. A U.S. aid organization Y.E.S. Uganda helped AIDS orphans like him attend school. Ategeka did well. He impressed the California family that sponsored him so much that they invited him to come live with them in 2006. Since then, he has earned engineering degrees at University of California, Berkeley, where he'll begin a doctorate in mechanical engineering this fall. And he's been using what he learned already to solve the problem that contributed to the death of his brother nearly 20 years ago. Ategeka founded CA Bikes, a nonprofit that teaches villagers how to build bike ambulances and wheelchairs from scrap metal. "I teach you how to make it, and I teach you how to fix it," he says. "If it breaks, you know what to do, and if you want to build something you think outside the box and you do it." So far, he estimates the group has helped support the fabrication at centralized workshops in local villages and distribution of more than 1,000 bikes and bike ambulances throughout Uganda. 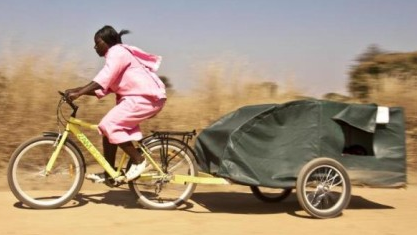 Just 100 bike ambulances can transport about 10,000 people a month, according to Ategeka. One ambulance costs an equivalent of $600 to make. The group's goal is to connect rural communities in Uganda with clinics in cities. The nonprofit has caught the eyes of major funders, like U.S. Embassy in Uganda and the President's Emergency Plan for AIDS Relief. "I wanted to do something about the effects of lack of health care in rural villages, so I combined my life experience and engineering," Ategeka says. The group's bikes are used for many purposes. Of course, they're able to transport patients to hospitals. But they also serve as delivery vehicles, picking up HIV medications and basic medicines for local villagers. "When you talk about HIV/AIDS or TB, the issue is delivering medicine to patients who need to take it on a regular basis," Dr. Arthur L. Reingold, a professor at Berkeley's school of public health, tells Shots. The organization also provides bikes for kids to go to school. A survey conducted by CA Bikes found school attendance and performance increased by about 90 percent after boys and girls got bikes. "When I got my bike life became much easier," Ategeka says, recalling his youth "Hours of walking became minutes of riding." Still, the are some limitations. "In mountainous areas it can be extremely difficult to pedal great distances," Reingold says. 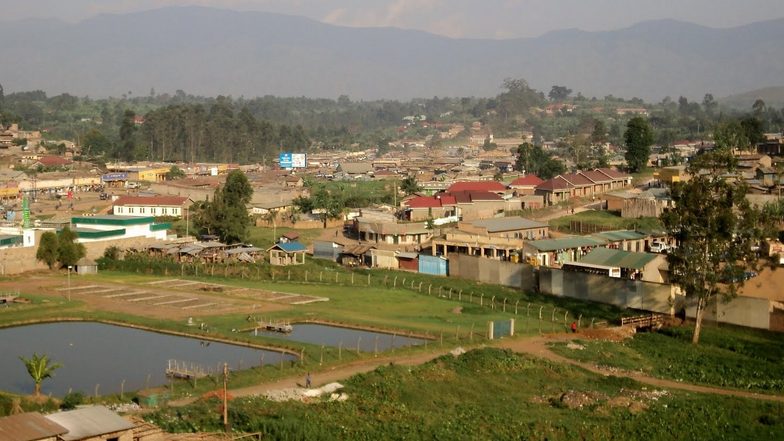 The view of Fort Portal, Uganda, from Rwengoma Hill. A goal for CA Bikes is to create jobs and to be self-sustaining. Funding for the project is constant challenge. The demand for the bicycle ambulances is outstripping the supply. Ategeka keeps at it. He marvels at the villagers' ability to make things work. "The human spirit is really, really strong," says Ategeka.